Colcord Cottage è un cottage per ospiti estivi per eccellenza che si trova a Searsport sulla Penobscot Bay. Goditi la vista sull'oceano da quasi tutte le stanze, osserva le maree che cambiano, ascolta le onde mentre dormi ed esplora la spiaggia privata. Il cottage recentemente ristrutturato dispone di una cucina completamente attrezzata, sala da pranzo, ampio soggiorno, 2 camere da letto, 1 bagno completo, nuovi letti, divano letto, divano letto, tutti i comfort di casa. Si trova sulla strada 1, a solo un'ora dal parco nazionale di Acadia, a 10 minuti da Belfast, a 30 minuti da Camden e a 40 minuti da Bangor. Impeccably clean and well appointed. High guality beds and bedding. Fluffy white towels. Ridiculously well stocked kitchen (Tommy Bahama dishes!). Don’t be put off by the front as you pull off the main road (owner renovating the front house - the cottage is in the back). 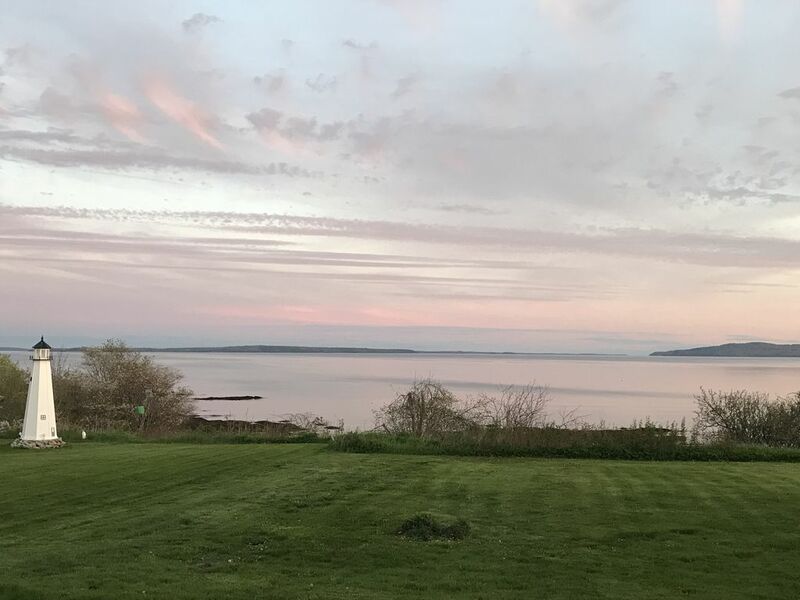 The magic is the view of the bay as you turn the corner after parking in the driveway and are greeted by an expansive and very private back yard. Great front deck - firepits -spotless grills and stairway to the waters edge! Very nice and well appointed. Cute little cottage. Beautiful views. Denise has it well stocked and you couldn't want for anything down to fingernail polish remover for the ladies. Only thing missing - sound of the waves unless it is raining and the wind is blowing more than just a breeze. However, you will enjoy watching the red squirrels bringing the berries up on the porch and having a meal or chattering in the trees. Very nice! Convenient to Bar Harbor and Acadia. Colcord cottage was the perfect getaway. We went to Maine for a little escape and for a bonding experience with my kids. The cottage was decorated beautifully. Denise and Ernie were so welcoming and made sure the experience was amazing. The views were spectacular and the location was convenient for exploring. They had a kayak for us to use which we really enjoyed. There were many fond memories made here and I would definitely recommend Colcord Cottage to anyone. Thank you, Rachel! We enjoyed having you and your Daughters and we're so happy you had a great experience! Thank you so much, Kelley! You and your Family were a joy to have as guests and we hope to see you again! From the moment you walk in the cottage is warm and inviting. It is impeccably decorated in a classy seaside style. The cottage is well equipped with any item you may need. Every little detail has been thought of! We truly enjoyed spending time here and enjoyed the full kitchen and outdoor grill. Denise and Ernie are wonderful hosts and you can immediately feel the labor of love they have for this cottage!! We cannot wait to return and share with our friends this beautiful property!! Thank you for a wonderful vacation week!! Thank you, Wendy! You and your Family were super guests! We're so pleased you enjoy your stay and we look forward to seeing you next year!!! Having made many, many trips to Maine over the years, we've stayed in a variety of places - Colcord Cottage was truly one of the best. Denise and Ernie are wonderful hosts for this sweet cottage on the bay, they've truly thought of every amenity for the comfort of their guests. The cottage is beautifully decorated, immaculately clean, and comfortable in every way. We loved being able to sit on the porch in the morning and evenings just soaking in the view. It's so peaceful and relaxing. The sunrises and sunsets were gorgeous from that vantage point. You can also take the steps down to the rocky beach area at low tide and explore, or take advantage of the kayak provided if you're feeling adventurous. The kitchen is fully stocked with every possible need covered - even a crock pot and bakeware! We enjoyed being able to cook and bake while we were there, it was a nice alternative to eating out every meal. Even though there are plenty of good restaurants close by - we especially enjoyed Darby's and The Daily Soup in Belfast, and Crosby's Drive-In in Bucksport had some of the most delicious Fried Haddock ever. The beds were all very comfortable and it was nice to have all the linens provided. There were plenty of fluffy towels for the bathroom too. Thank you Denise and Ernie for a wonderful stay - you truly understand the meaning of hospitality! Thank you so much for the kind words! We certainly enjoyed having you and your Family stay at our cottage. You were wonderful guests and we hope to have you back soon!